Wayne Rooney is the only British player to be named on Fifa's 23-man Ballon d'Or shortlist for 2012's best player. Rooney's Manchester United team-mate Robin van Persie joins Manchester City trio Sergio Aguero, Yaya Toure and Mario Balotelli on the list, as does 2011 winner, Barcelona's Lionel Messi. Premier League bosses Roberto Mancini, Sir Alex Ferguson and Roberto Di Matteo are on the Coach of the Year list. The winners will be announced at a ceremony in Zurich on 7 January 2013. These will be selected by the captains and head coaches of the men's national teams as well as by international media representatives selected by France Football magazine. 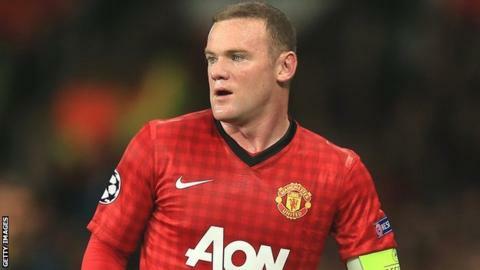 Rooney, 27, scored 19 goals in 2012 to help Manchester United to a second-place finish in the Premier League. He also scored four goals for England, including one at Euro 2012 against Ukraine. Striker Didier Drogba, who scored the winning penalty in Chelsea's Champions League final shoot-out win over Bayern Munich - his final kick for the club before leaving to join Shanghai Shenhua - is also in contention for the Ballon d'Or. Real Madrid have six nominees, including former Manchester United forward Cristiano Ronaldo and ex-Liverpool midfielder Xabi Alonso, while Jose Mourinho is named on the coach list. The shortlist will be narrowed down to three names for each category on 29 November. Has Rooney fulfilled his potential? Read more on Wayne Rooney: Has he fulfilled his potential?